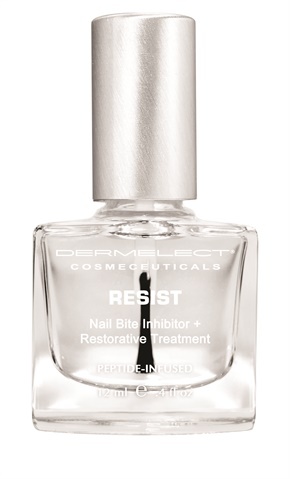 Dermelect Cosmeceuticals’ new Resist Nail Bite Inhibitor + Restorative Treatment is a clear nail polish with a bitter taste that will discourage nail biting or thumb sucking clients from giving into the habit. This peptide-infused nail strengthening treatment also works to restore damaged nails and cuticles. You can use the nail bite inhibitor as a base coat or a high-shine top coat, and it can be used on anyone age 3 and up. For best results, apply one to two coats and allow it to dry. A great retail item, clients can follow up at home with an application every two days. For more information, visit www.dermelect.com.